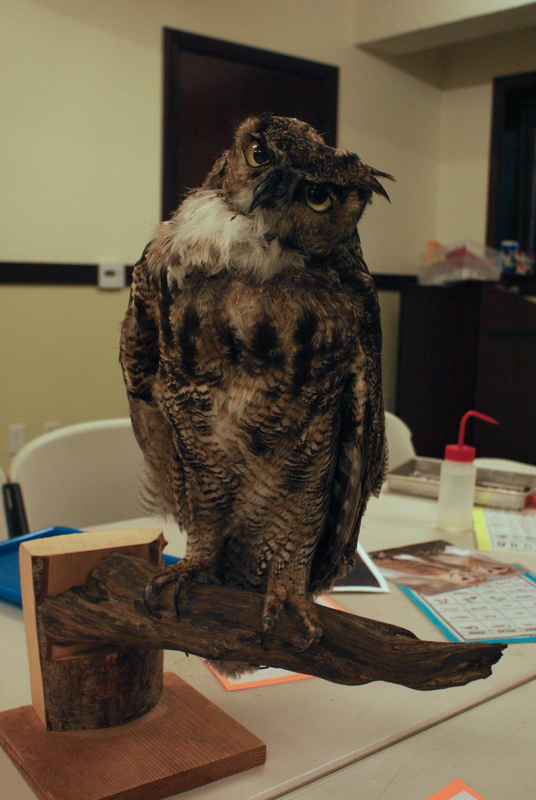 Last weekend I had the chance to go to an Owl Prowl at Seward park down in Seattle. The class started off with owl pellet dissection – usually I have the kids with me at events like this, but this time I was by myself and was able to do the dissection myself. 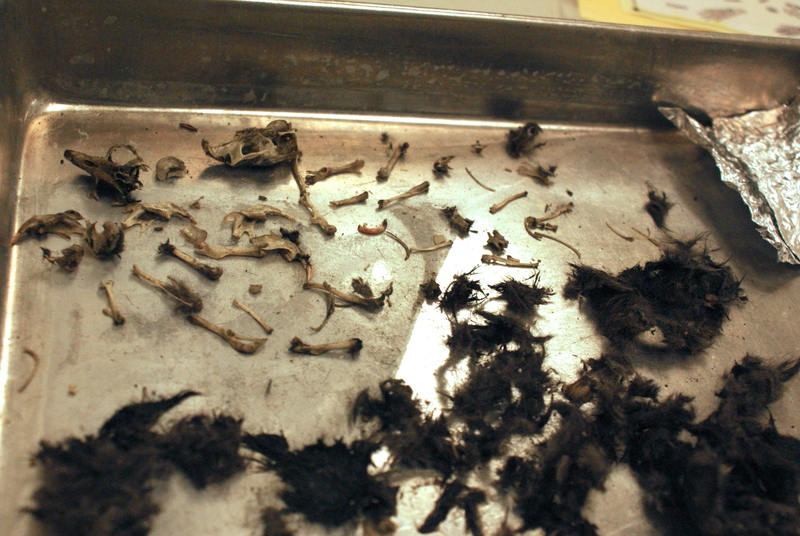 I had fun pulling apart the furry pellets while the naturalist talked about our local owls, their anatomy and adaptations to the night, their plumage and the calls they make, and other interesting facts. We got to see owl pelts up close to get a good look at the beautiful markings. While this was going on, the sun was getting closer to the horizon and light was fading outside. Soon it was time to head out on the trails to see if we could hear or see any owls. We were in luck this day – very soon we were able to hear the begging calls of a pair of barred owl fledglings. After carefully looking up into the dusky trees, we could see the two young birds on branches, as curious about us as we were about them. They made a raspy Tzzzt sound to call for food from their parents, who were out hunting elsewhere. It was fascinating standing there watching them twist their heads around and flap awkwardly from one branch to the next. We didn’t see any barn owls, but we did see several bats flitting around, and the naturalist showed us the tree where the barred owls had their nest, as well as the tree where the bald eagle nest is. We also got a view of the Super Moon as it rose, before the clouds came in and covered it. All of this was happening in a very busy city park, with people blasting car stereos, playing drums in the field, and cars driving all around. This class started at 8 pm and went until 10:00. There were 2 kids there, and I think they both left early. If you have children 8 and up and want to bring them, try to come to one of the classes later in the summer when the starting time will be earlier. But be warned that kids will need to be comfortable in the dark, and need to be able to walk on dark trails without flashlights. Info on these classes is here: http://www.brownpapertickets.com/producer/17346. If night adventures sound fun to you, check out my latest article in ParentMap! We’ve got lots of opportunities to get out at night with our kids.